FOLLOW-UP STATUS - Status furnished by supply. Intervals for follow-ups should not exceed 7 days for NORS/ANORS, 14 days for priority "B," and 30 days for priority "C" requisitions. RECEIVED DATE - Date indicating when the document ordering the items was processed. ISSUED DATE - Date item was issued to the shop for installation. 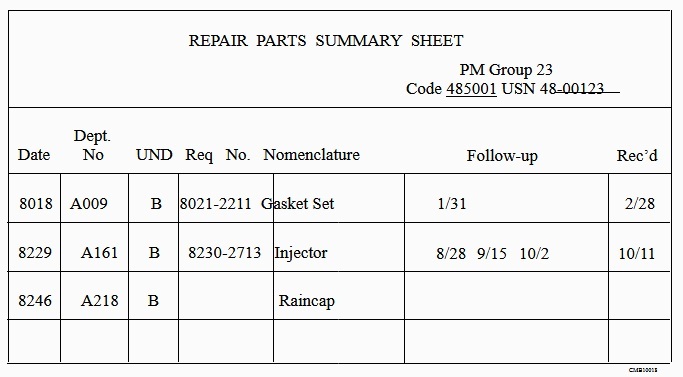 The repair parts summary sheet (fig. 1- 18) shows all parts on order for each vehicle. One sheet is maintained for each USN number; the summary sheets are filed in PM group order. This is for the convenience of the DTO clerk, because the DTO parts bins and the PM EROS are arranged in the same order. All EROS pass through the DTO clerk to preclude the accidental reordering of items. This also allows the DTO clerk to attach a DTO Information Sheet (fig. 1-19) to the ERO that parts have been received and are in the DTO bin. Summary sheets provide ready reference for determining the quantity of parts received from a multiple order; for example, parts for an engine equipment is transferred or disposed of, the summary sheet is used to identify outstanding requisitions, so they may be canceled. The heading on each summary sheet must show the EC and the USN number. The columns required on a repair parts summary sheet are listed and explained below. DATE - Julian date the NAVSUP Form 1250 was submitted to supply. DEPARTMENT NUMBER - This number serves as a cross reference between the DTO log and the summary sheets. UND - Urgency-of-Need Designation (Priority A, B, or C). REQUISITION NUMBER - Entered when the yellow copy of NAVSUP Form 1250 is returned from supply with the requisition number entered. NOMENCLATURE - Description of the item ordered. FOLLOW-UP - Dates that the DTO clerk requested the status from supply. RECEIVED-Date indicating when the overhaul, deadline equipment, and so forth. When document ordering the items was processed.